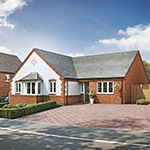 Located on our new Churchfields development, The Hatfield is a grand four bedroom home with a double garage and flexible living space. Inside you'll find a large family kitchen with an island unit and there is a separate lounge with a log burning stove. This home offers spacious accommodation and a stylish interior specification to match. Now available to reserve off-plan with Help to Buy available.